[PDF] Essentials of Human Anatomy & Physiology (10th Edition) | Free eBooks Download - EBOOKEE! 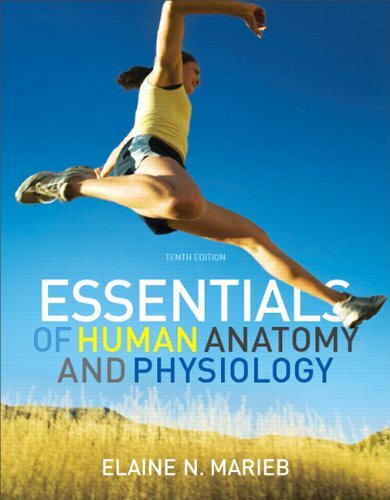 Description: Now in its Tenth Edition, Essentials of Human Anatomy & Physiology continues to set the standard for short-course A&P texts. Its dramatically updated art program, more streamlined presentation of material, and integration of chapter objectives will help you better visualize and understand the structure and function of the human body. Elaine Mariebâ€™s clear and friendly writing style emphasizes the relevance of anatomy & physiology to your life and future career. The book clarifies concepts, defines key terms, and offers just the right balance of anatomy, physiology, and clinical coverage to make the content complete without being overwhelming. Elaine Marieb wrote this book specifically for the one-semester course and continues to carefully select a range of material that proves just right for the shorter course. New information on hot topics like the HPV Vaccine, Infantile Polycystic Kidney disease, and Sudden Infant Death Syndrome (SIDS) draws students into the material. No comments for "[PDF] Essentials of Human Anatomy & Physiology (10th Edition)".